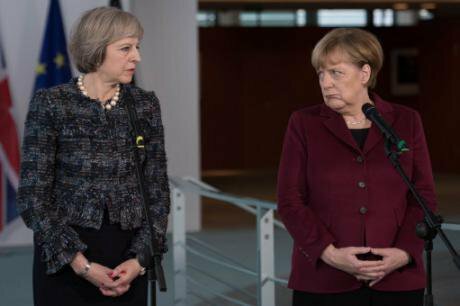 Theresa May and Angela Merkel, the German Chancellor. January, 2017. Stefan Rousseau/ Press Association. All rights reserved.If Members of Parliament could shed their attitude of servility to the Prime Minister and government, this is what they should do: The House of Commons should elect its own leadership in the form of a committee of speakers – the Speaker and five or six deputies – to be in charge of parliamentary business and represent and speak for Parliament. The post of “Leader of the House” should be abolished.Parliament wants to consider the government’s Brexit plan. The Prime Minister is resisting any serious involvement by Parliament. We have a parliamentary democracy. Parliament does not need to ask the Prime Minister. It should instruct her.We the people elect Members of Parliament to manage out joint affairs: laws, public policy and budgets. Parliament appoints a government to implement parliamentary decisions and prepare parliament business. Parliament is the democratic boss. The government is its servant.However, in Britain, constitutional practice, in this as in so much, is ambiguous. Brexit has plunged the country into a power struggle between Parliament and government. This has given Parliament a golden opportunity to assert itself and improve the constitution.There are two reasons why it is difficult for the British Parliament to exercise its full democratic. First, Parliament is not in control of its own agenda. “The Leader of the House” is appointed by the government and manages parliamentary affairs under the government’s instructions. Parliament has no leadership of its own and no one has a mandate to speak for Parliament as such. The Speaker, who is elected by Parliament, has in this respect only a ceremonial role. Hence, in the ongoing power struggle, there is the government on the one side with all of its apparatus, and on the other side only individual MPs who can no more than appeal to the Prime Minister to involve Parliament. Parliament as such has no voice.The other reason is in attitudes. It is thought normal by most people in and around Parliament and Whitehall that it is right and proper that the government, once appointed by Parliament, should be in command. The Prime Minister insists that she should be in command of the Brexit process by “royal prerogative” – but in a parliamentary democracy the Prime Minister can have no other prerogative than is accepted by Parliament.The constitutional practice in which the government dominates Parliament makes for an unsafe system of decision making. The government, the Prime Minister really, has too much of a free hand and government business is not tested by adequate oversight and scrutiny. The Chilcot report last year levied a broadside of criticism against our system of political decision making which enabled Britain to fall into the catastrophe of the Iraq war. Britain is in fact badly governed in general. In their brilliant book The Blunders of our Governments, Antony King and Ivor Crewe, both esteemed constitutional experts, show that badly prepared and mistaken decision making is rather the rule than the exception. The reason for this is not that our politicians are incompetent but that the system is dysfunctional.We would be better governed if there were a more balanced relationship between Parliament and government. The weak link in the system of decision making is the House of Commons.In the ongoing power struggle the Prime Minister has, unwisely, decided to protect the government’s supremacy over Parliament. She now wants decision making over Brexit to be conducted in the same way that has long caused blunders great and small. Iraq was a big issue in which Britain got it wrong. Brexit is a big issue that is again being managed under an unsafe system of decision making. Parliament now has the opportunity to improve on our political system – if MPs are able to learn from previous mistakes and act in accordance with their instinct. The reform of parliament on which Stein Ringen is embarking is an important, nay vital, project: the executive/Government has dominated the legislature/Commons for longer than the past century – ever since Parnell’s brilliant manipulation of the Parliamentary timetable that led to the Government seizing control of Standing Orders in order to control him. Since when, as he rightly says, the Commons has been in thrall to the Government. It was precisely to address this that Parliament First – an All Party Group of MPs – was established in 2003. It consisted, mainly, of former Ministers who despaired of the way that Thatcher and then Blair were flagrantly manipulating Parliament to such an extent that the Commons voted to “deem” that legislation had been considered and scrutinised when it had not been, so that swathes of legislation was being waved through ‘on the nod’. Parliament First included Ken Clarke, George Young, Gwyneth Dunwoody, Alex Salmond, Douglas Hogg, Michael Meacher, Tam Dalyell, Bob Marshall Andrews, Frank Field, Tony Wright, with me as Chair. Among its aims were the establishment of a Business Committee to give the Commons a say in setting its own business; the election, and payment, of Select Committee Chairs; the payment of Select Committee Chairs to create an alternative to Ministerial office; the curtailing of prerogative powers, and the separation of responsibilities and powers. It was initially quite effective and led to Gordon Brown establishing a Committee to consider the issue under the chairmanship of Tony Wright. The Select Committees have indeed been strengthened but the overall balance between executive and legislature remains unchanged, and neither David Cameron nor Theresa May has given any indication that they recognise the problem, far less that they intend to address it. The impasse between the Government and the Supreme Court over Brexit is a return to the worst of the past. The Scottish Parliament, unconstrained by history, has attempted to establish a Business Committee that could provide some parity, but it has not proved very effective. Until we address this imbalance we will not have an effective legislature. But a larger team of deputy speakers is not the way forward. We have in the present Speaker, John Bercow, a speaker who is far more independent minded than any previous speaker in our lifetime. He does not flinch from supporting back bench MPs, and opposition parties, but independent minded speakers will not in themselves provide a solution. That can only be achieved if the Commons gets off its backside and asserts itself by, for instance, tackling the standing orders; by establishing a Petitions Committee to give the electorate a say in legislation; by making pre-legislative scrutiny the norm; by scrutinizing non-departmental expenditure and Private Finance Initiatives; above all by distinguishing between the proper responsibilities of the Commons and the Government. It is entirely right that the Government, having gained a mandate for its programme at an election, should have sufficient time to introduce the legislation necessary to implement that programme. But legislation takes up much less than half the time of the Commons. What is not proper is that Government should control all of the work of the legislature : when the House should sit; what business should be; how Parliament should be administered. Parliament must find the self-confidence to make it clear that it is distinct from Government, that it is not a creature of the Executive, as it has too often become in recent years; that is, in short, a partner of Government. Only if it is capable of doing that, will we have a democracy that is truly effective and of which we can be proud. So … the problem is clear, but the solution is not .. .. yet.